U.S. 101 travels 365.55 miles within the Evergreen State. The route hugs the Pacific Coast from the Columbia River north of Astoria, Oregon to a point north of Lakaloch west of the Olympic Mountains. The US route encircles the Olympic Peninsula east and south to Shelton and its terminus at Olympia. The original “northern” terminus of U.S. 101 was located in downtown at the intersection of 4th Street and Capitol Way, where U.S. 99 turned east from the Capitol area to Lacey. After 1949, Olympia converted 4th Street and parallel State Avenue into a one-way street couplet, shifting the beginning of U.S. 101 one block further north.2 U.S. 101 shifted a freeway bypass south of Olympia in 1959. U.S. 410 originally traveled between Aberdeen, Washington and Lewiston, Idaho. The designation was vastly replaced by an extension of U.S. 12 west in 1967. From west to east, U.S. 410 traveled U.S. 12 between Aberdeen and Elma, Washington 8 from Elma to Mud Bay, with U.S. 101 from Mud Bay to Olympia, with U.S. 99 from Olympia to Tacoma, Washington 167 from Tacoma to Sumner, Washington 410 from Sumner to Naches, and U.S. 12 from Naches to Lewiston. 11th Avenue SE heads west from Capitol Way (Old U.S. 99) to the General Administration building and east to the Natural Resources building of the State Capitol Campus. Photo taken 09/02/06. Union Avenue follows in one block along Capitol Way north. An Interstate 5 trailblazer directs motorists onto Union Avenue east to Plum Street for the respective freeway on-ramps. Photo taken 09/02/06. Legion Way provides an alternate route to Plum Street for motorists bound for Interstate 5 from Old U.S. 99 (Capitol Way). Photo taken 09/02/06. 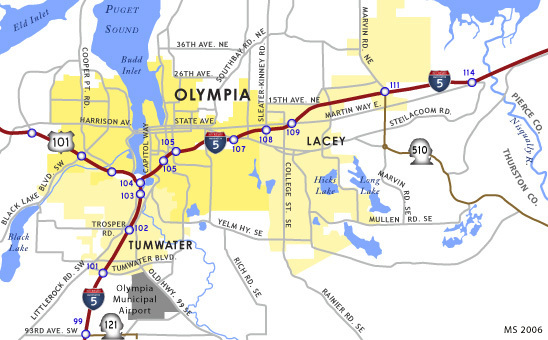 4th Avenue leads east from Capitol Way and downtown Olympia to Plum Street south to Exit 105 of Interstate 5 or Pacific Avenue east to Exit 107. Photo taken 09/02/06. Entering the intersection with 4th Avenue on Old U.S. 99 (Capitol Way) north. 4th Avenue represents the historical turn of U.S. 99 east from Capitol Way. The intersection doubles as the historic end of U.S. 101 and transition of U.S. 410 from an overlap with U.S. 99 east to Tacoma and west to Mud Bay. Photo taken 09/02/06. Capitol Way north at State Avenue. State Avenue flows west as the counterpart to 4th Avenue east. State Avenue carried U.S. 99 south from Pacific Avenue after 1949 and until 1958. State Avenue west from Capitol Way represents U.S. 101 north after 1949 as well. Photo taken 09/02/06. Historic U.S. 99 (Capitol Way) south at Legion Way in downtown Olympia. A state-named trailblazer for Interstate 5 directs motorists to remain on Capitol Way south to 14th Avenue SE at the State Capitol Campus. Photos taken 09/02/06. Capitol Way southbound at the intersection with Union Avenue. Union Avenue leads west to the General Administration building of Capitol Campus and east to Plum Street near Exit 105 of Interstate 5. Photo taken 09/02/06. Southbound Capitol Way enters the State Capitol Campus and intersects 11th Avenue SW. Photo taken 09/02/06. Looking at the State Capitol Dome and Tivoli Fountain from old U.S. 99 (Capitol Way) southbound. Photo taken 09/02/06. 14th Avenue SE and Sid Snyder Avenue come together at Capitol Way near the Capitol Campus Visitor Center (connected by the pedestrian overpass in this photo). 14th Avenue utilizes a cut and cover tunnel to the east, providing direct access to Interstate 5 at Henderson Boulevard. Photos taken 09/02/06. Approaching Jefferson Street SE on 14th Avenue SE west. A cut and cover tunnel carries the road under the Capitol Campus between Jefferson Street and Capitol Way. Photos taken 09/02/06. Entering the 14th Avenue SE tunnel, motorists split into a four-lane tunnel and ramps to the garage below East Plaza of the Capitol Campus. Photo taken 09/02/06. Westbound 14th Avenue SE within the Capitol Campus tunnel. Portals open between the four-lane arterial and the parking area on the south side of the structure. Photo taken 09/02/06. 14th Avenue SE emerges at the signalized intersection with Capitol Way South. Diagonal South and Sid Snyder Avenue SW partition from 14th Avenue to the Temple of Justice and Legislative Building respectively. Capitol Way is the original alignment of U.S. 99 from downtown Olympia south to Capitol Boulevard. Photo taken 09/02/06. Motorists bound for Interstate 5 are directed into separate lanes as 14th Avenue SE leaves the State Capitol area and travels through a cut and cover tunnel. Photo taken 09/02/06. Traveling through the 14th Avenue Tunnel between Capitol Way (Old U.S. 99) and Jefferson Street. The four-lane arterial passes under East Plaza of the Washington State Capitol Campus. Photo taken 09/02/06. 14th Avenue SE continues beyond Jefferson Street directly to a trumpet interchange with Interstate 5 (Exit 105). Interstate 5 meets the end of U.S. 101 at the next southbound interchange (Exit 104). Photo taken 09/02/06. Travelers bound for Interstate 5 south to Portland, Oregon depart 14th Avenue SE. 14th Avenue continues across Interstate 5 to the northbound ramp and a roundabout with Henderson Boulevard. Photo taken 09/02/06. Columbia Street south at 4th Avenue (historic U.S. 101 & 410) in downtown Olympia. 4th Avenue carried U.S. 410 east & 101 south until 1958. Photo taken 09/02/06. Southbound Columbia Street at 5th Avenue. 5th Avenue enters the city center from Capitol Lake Park. Photo taken 09/02/06. State Avenue carried U.S. 101 north from U.S. 99 (Capitol Avenue) two blocks to Water Street and 4th Avenue between 1949 and 1958. Columbia Street interests historic U.S. 101 one block west of Capitol Avenue. Photo taken 09/02/06. Interstate 5 trailblazer posted along Union Avenue east at Capitol Way (Historic U.S. 99). Union Avenue connects with Plum Street ahead Bay Drive. Bay Drive connects with Interstate 5 at Exit 105. Photos taken 09/02/06. End of US highway 101 (Dale Sanderson). Page Updated November 9, 2010.